WASHINGTON, D.C. (April 30, 2014) ,– L’Enfant Plaza, an office and retail mixed-use development owned and managed by The JBG Companies, is being readied for public reintroduction this summer after a series of transformative and extensive renovations invested over the past few years comes to fruition. More than one dozen additional retail and dining tenants will open in coming months, bringing a new vibrancy to L’Enfant Plaza’s freshly repositioned and remarkably brighter shopping level. New destinations, such as Phillips Seafood, Amsterdam Falafel, and Red Robin’s Burger Works, will introduce even more options to customers who’ve embraced the enhanced L’Enfant Plaza food court, while a new and highly visible sculptural glass gateway will grant customers a plaza-level entrance to the shopping level. New soft seating, Wi-Fi access and more will foster a relaxed environment for office workers and tourists alike. Additional property transformations will deliver this fall, including lobby and other significant interior renovations in the office building located at 955 L’Enfant Plaza, which complements similar upgrades completed in 2012 to the office buildings at 470 and 490 L’Enfant Plaza. 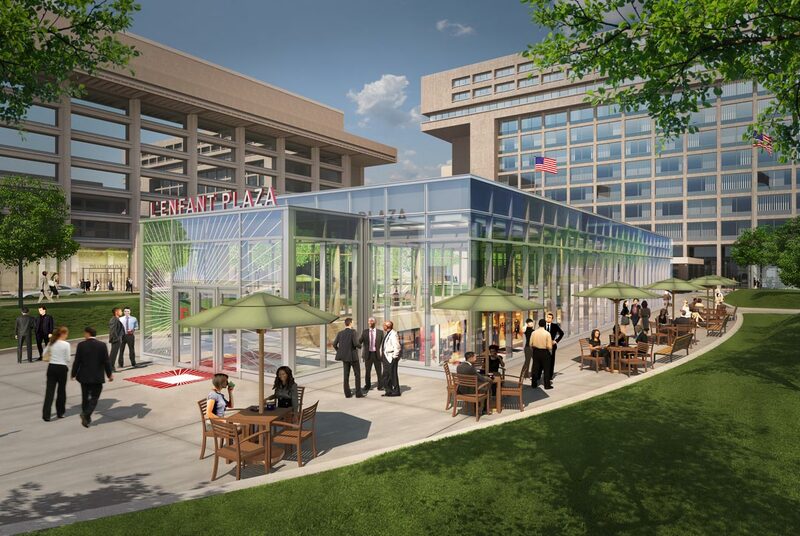 These extensive improvements represent the culmination of JBG’s efforts to reimagine L’Enfant Plaza for National Mall tourists, local office workers, Metro riders and others who live, work and play in Washington. Notably, L’Enfant Plaza won an Award of Excellence in October 2013 from the National Association of Industrial and Office Parks (NAIOP) for the Best Retail Project in the Dining & Entertainment category in the Maryland/DC region. JBG collaborated with SmithGroupJJR, one of the nation’s top design firms, to transform the retail space that previously felt “underground” into a light-filled and open destination for the 30,000 employees within walking distance. The designers created a modern and bright aesthetic along with a strong sense of identity for L’Enfant Plaza with the introduction of a rich palette of materials and finishes along with vibrant environmental graphics. “The design transformation over the last five years creates a dynamic destination for the decades to come,” said Andrew Rollman, AIA, LEED AP, a leader with SmithGroupJJR’s Workplace architectural practice. Easily accessed from the bustling L’Enfant Plaza Metro station, the property’s growing list of office and retail tenants are also poised to benefit from a developing grand plan to enhance pedestrian appeal of the 10th Street corridor. Coupled with the recent launch on the plaza level of Bike and Roll, which offers bicycle and Segway tours and rentals, L’Enfant Plaza is enhancing one of the District’s primary crossroads. The retailers at L’Enfant Plaza represent an ideal opportunity to serve local workers, visitors and residents. Five million commuters pass through L’Enfant Plaza Metro station annually. Many of these workers benefit from direct, indoor access to the variety of shops, services and restaurants at L’Enfant Plaza. Headquartered in Chevy Chase, Md., The JBG Companies is a private real estate development firm that develops, owns and manages office, residential, hotel and retail properties. The company has more than $10 billion in assets under management and development in the Washington, DC area. Since 1960, JBG has been active in the communities where it invests, striving to make a positive impact. More information can be found by visiting the company’s website, www.JBG.com, or by calling 240.333.3600.